Welcome to the January 2019 ISAC Update for financial aid administrators and business officers. This version of the electronic ISAC Update is a compilation of e-Messages sent through ISAC's e-Messaging service throughout January. Sent to Financial Aid Directors and Financial Aid Administrators on January 29, 2019. Due to the extreme weather conditions that Illinois will be experiencing over the next two days and the likelihood that many colleges will be closed, we have decided to postpone the ISAC Update webinar that was scheduled for Wednesday, January 30 at 2 p.m. until a later date. The ISAC office expects to be open during its usual business hours. Sent to Financial Aid Directors, Financial Aid Administrators, Public Schools - Participating in the ING Grant and IVG Programs, and FFELP Administrators on January 25, 2019. Sent to Financial Aid Directors, Financial Aid Administrators, Public Schools - Participating in the ING Grant and IVG Programs, MAP Users, Business Officers, and FFELP Administrators on January 24, 2019. To participate in these webinars, visit the Partner Training page in the e-Library at isac.org to access the webinar link and presentation materials, both of which will be posted on the day of the session. Registration is not required for the webinars, and any specific questions you would like a webinar to address may be submitted via e-mail to Kimberly.Eck@illinois.gov prior to the session. Sent to Financial Aid Directors, Financial Aid Administrators, Public Schools - Participating in the ING Grant and IVG Programs, MAP Users, Business Officers, and FFELP Administrators on January 22, 2019. Sent to Financial Aid Directors, Financial Aid Administrators, Public Schools - Participating in the ING Grant and IVG Programs, MAP Users, Business Officers, and FFELP Administrators on January 11, 2019. The Illinois Student Assistance Commission (ISAC) would like to make you aware of the following information, which may be of interest to you and/or your students. Unless otherwise noted, links in this message are to corresponding pages at ISAC's website (isac.org). The next meeting of the Illinois Student Assistance Commission is scheduled to take place on Thursday, April 4, 2019. Specific details, including the meeting time and location and a listing of tentative agenda items, will be available prior to the meeting via the ISAC's Governing Board: The Commission section of the About ISAC area. Visit the Commission Meeting Schedule page for a listing of all meetings scheduled in 2019. Mark your calendar for the 50th Illinois Association of Student Financial Aid Administrators (ILASFAA) annual conference, which will take place March 18-20, 2019 at the President Abraham Lincoln Springfield, a DoubleTree by Hilton Hotel. For more information, visit ilasfaa.org to access the conference website. 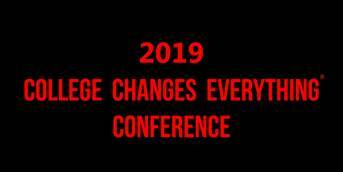 The ninth annual College Changes Everything® Conference will take place on Thursday, July 18, 2019 at the Tinley Park Convention Center. Further details are provided in a December 13 e-Message. ISAC offices will reopen on Tuesday, January 22. ISAC offices will reopen on Wednesday, February 13. ISAC offices will reopen on Tuesday, February 19. Although ISAC's offices will be closed on the days listed above, the Monetary Award Program (MAP) component of the GAP Access portal will be available during regularly scheduled hours and will reflect records processed by the Central Processing System (CPS) through the last business day immediately preceding each respective holiday. Results for payment requests submitted from 5 p.m. (CT) the business day prior to the holiday through 5 p.m. (CT) the business day following the holiday will be available via the MAP system on the morning of the second business day after the holiday. For example: a MAP payment request submitted at 6 p.m. (CT) on Monday, January 21 will be processed the evening of Tuesday, January 22 – and payment results will be available via the MAP system the morning of Wednesday, January 23. Access the Financial Aid Administrators area anytime, or send an e-mail message to ISAC's School Services Department. With the exception of days when the ISAC offices are closed, ISAC staff will review and respond to messages during regular business hours (Monday through Friday, 8 a.m. – 4:30 p.m. CT). School Services staff also may be reached toll free at 866.247.2172 during regular business hours. Note: Effective January 2, 2019, students and parents may reach the ISAC Call Center (Student Services) on weekdays from 8 a.m. – 4:30 p.m. CT.
A December 18 e-Message announced a partial release of MAP grants from suspense status. This limited release will benefit eligible students whose Free Application for Federal Student Aid (FAFSA®) receipt dates were February 28, 2018 through (and including) April 4, 2018. All MAP grants for eligible students with initial FAFSA receipt dates on or after April 5, 2018 remain in a suspense status. Watch for future updates regarding this program via the standard communication methods (i.e., the FAA Message Board, the MAP Program News section, and ISAC's e-Messaging service). Remind your students that March 1, 2019 is the spring- and summer-term award deadline for the 2018-19 Illinois National Guard (ING) Grant Program. Students may access the application via the Applications page (which is located within the Students & Parents – During College – Applying for Financial Aid area, and may also be obtained via the "Applications" link that appears at the bottom of all pages on the ISAC website). Applications received after March 1 will be considered for summer term only awards. Remind your students that March 1, 2019 is the spring- and summer-term award deadline for the 2018-19 Grant Program for Dependents of Police, Fire, and Correctional Officers. Students may access the application via the Students & Parents – During College – Applying for Financial Aid area, and may also be obtained via the "Applications" link that appears at the bottom of all pages on the ISAC website). Applications received after March 1 will be considered for summer term only awards. In order to be considered for payment, all 2018-19 MAP first- and second-term claims must be submitted to ISAC no later than Friday, March 8, 2019. Specific details are provided in a January 8 e-Message. Spring-term benefits used data for the 2018-19 ING Grant Program is due during the month of April (colleges will be notified once a specific deadline date has been established). Benefit Request records are available in the ING Grant system, allowing colleges to report enrollment hours and benefit dollar amounts for initial, supplemental (adjustments), in-district and out-of-district requests. New data for students eligible for benefits will be available whenever there is a new or updated eligible record for the college. While new data could potentially be available on a daily basis, the college may not have students that appear in the system each day. It is recommended that the college check the ING Grant system at least once a week for new student data that may have been posted for the 2018-19 academic year. Please submit your data as soon as you are able to do so. Further information, including access to the ING Grant Benefits Usage Processing User Guide, is available via the ING Grant Electronic Processing page of the Financial Aid Administrators – Processes area. Spring-term benefits used data for the 2018-19 Illinois Veteran Grant (IVG) Program is due during the month of April (colleges will be notified once a specific deadline date has been established). Reporting of enrollment hours must take place so that benefit usage (i.e., eligibility units) can be accurately assessed to students' accounts. IVG benefit usage functionality is available in the IVG system, allowing colleges to report 2018-19 enrollment hours and benefit dollar amounts for initial, in-district and out-of-district requests, as well as adjustments to previously-submitted data. A December 12 e-Message provides details regarding an enhancement to the IVG system that provides colleges with the ability to view a student’s history of IVG benefit usage at all colleges that have reported this data to ISAC. Remember that, even though the summer term begins the IVG Program processing cycle each year, the IVG system designates the terms as follows: fall is Term 1, spring is Term 2, and summer is Term 3. Further information, including access to the IVG Program User Guide, is available via the IVG Electronic Processing page of the Financial Aid Administrators – Processes area. The Teacher Education Scholarship Programs (TESP) component of My Zone that allows colleges to complete students' initial certifications online for the Minority Teachers of Illinois (MTI) Scholarship and Golden Apple Scholars of Illinois programs remains available for the 2018-19 academic year. Remember that all initial certifications available in My Zone must be completed, regardless of whether the college certifies a student as eligible or ineligible and regardless of whether the student is currently enrolled. The only way applicants will receive notification from ISAC regarding their eligibility status is if their colleges have submitted the certifications via My Zone. Be sure to continue completing and submitting initial certifications, in order to ensure that your students will be included in any rounds of awarding that take place. Resources regarding the awarding process – including how to generate a report and filter or sort student eligibility data – may be accessed from within My Zone's TESP Notification area. When the awarding process is complete, a payment request roster is produced and is available to be completed and submitted. Results for payment requests received will be available via TESP Payment Authorization after vouchers have been generated and the corresponding Voucher Numbers are entered into the My Zone system by ISAC staff. Vouchers are sent via e-mail to financial aid directors. Colleges are encouraged to check My Zone every week for results of previously-submitted payment requests. Further details regarding the payment process for the MTI Scholarship and Golden Apple programs are available in the ISAC Gift Assistance Programs area. Remind your students who plan to pursue a career in teaching that March 1, 2019 is the priority application consideration date for the 2019-20 MTI Scholarship Program. Students may access the application via the Applications page (which is located within the Students & Parents – During College – Applying for Financial Aid area, and may also be obtained via the "Applications" link that appears at the bottom of all pages on the ISAC website). Complete applications received after this date will be considered only if funding remains after all timely complete applicants have been awarded. Encourage all minority students who meet the program's eligibility requirements to apply as soon as possible. Public four-year institutions: remind your students who plan to pursue a career in teaching that March 1, 2019 is the priority application consideration date for the 2019-20 Illinois Special Education Teacher Tuition Waiver (SETTW) Program. Students may access the application via the Applications page (which is located within the Students & Parents – During College – Applying for Financial Aid area, and may also be obtained via the "Applications" link that appears at the bottom of all pages on the ISAC website). Complete applications received after this date will be considered only if available waivers remain after all timely complete applicants have been awarded. The 2019-20 FAFSA is still available online, and – if not already done – should be completed and submitted as soon as possible by students who will be attending college between July 1, 2019 and June 30, 2020. FAFSA results are used to determine eligibility for several forms of federal, state and institutional financial assistance, including MAP. Encourage your students to check out the Financial Aid Planning section of the Students & Parents area for information regarding resources that are available to help them complete the financial aid process. In addition, several events – including financial aid presentations – are being offered across the State of Illinois. Students may attend the event that best fits their schedule. Details regarding the 2019-20 application cycle may be accessed via the Applying for Financial Aid section of the e-Library. Sent to Financial Aid Directors, Financial Aid Administrators, MAP Users, and Business Officers on January 8, 2019. 2018-19 Monetary Award Program (MAP) second-term payment requests (claims), as well as all first-term claims (including late claims), are currently being accepted via the MAP system and by File Transfer Protocol (FTP). All first- and second-term claims must be submitted to ISAC no later than Friday, March 8, 2019 in order to be considered for payment. Claims submitted after this date will only be paid if funding is available after paying all claims submitted on or before March 8. ISAC has released some MAP grants from suspense status, impacting eligible students whose 2018-19 Free Application for Federal Student Aid (FAFSA®) receipt dates were February 28, 2018 through (and including) April 4, 2018. These records are eligible for a full-year MAP award. To be considered for payment, first- and second-term claims for these records must be submitted to ISAC by March 8th. All MAP grants for eligible students with initial FAFSA receipt dates on or after April 5, 2018 remain in a suspense status, and are not eligible for payment. Visit the MAP Payment section, located within the MAP portion of the ISAC Gift Assistance Programs area, for specific details regarding the claims process. Watch the FAA Message Board, the MAP Program News area and this e-Messaging service for the most up-to-date information regarding this program, including a future announcement of the 2018-19 MAP priority claim deadline for the third term (third quarter/second semester for institutions where the second semester begins after February 15th). Sent to Financial Aid Directors and Financial Aid Administrators on January 4, 2019. The following information is being shared to assist colleges in the administration of the Minority Teachers of Illinois (MTI) Scholarship and Golden Apple Scholars of Illinois (Golden Apple) programs [collectively, referred to as the Teacher Education Scholarship Programs (TESP)]. Effective Monday, January 7, 2019, colleges may again access the My Zone portal. In preparation for the eventual transition of MTI Scholarship and Golden Apple procesing into the ISAC Gift Assistance Programs Access (GAP Access) portal, maintenance and analysis are being performed. As part of this preparation, every precaution is being taken to protect applicants' personally identifiable information (PII), including Social Security numbers (SSNs). 2018-19 TESP Payment Authorization Reports that were generated in My Zone for the fall term included applicants' SSNs. In order to protect applicants' PII, all payment authorization reports generated in 2018 soon will be removed from the My Zone portal. Reports generated in My Zone from this point forward will not include SSNs. Colleges are strongly encouraged to print or save all 2018-19 payment authorization reports for the fall term on or before Friday, January 11, 2019. Sent on January 2, 2019. The December 2018 edition of the ISAC Update is now available for your review, and may be accessed via the Partner e-Messages & Newsletters section of the e-Library at isac.org. This version of the electronic ISAC Update is a compilation of e-Messages sent to financial aid administrators and business officers via ISAC's e-Messaging service over the past month.